I’ve been for drinks and nibbles at The Botanist a few times now and it is always buzzing with excitement and constantly busy. Located on the very lively Temple Street in central Birmingham, it is a popular destination for those that live and work in Birmingham city centre, with a lot of its trade focused on the after work drinkers and diners. It’s also a good spot for tourists (and hen parties) visiting Birmingham, as it’s only a few minutes from New Street Station and The Bullring. The bar is the main attraction of the venue, with the extensive garden themed drinks menu centralised around 50 botanical cocktails and gins of local origin. Cocktails include classics such as Strawberry Bellini, served alongside the eccentric and wonderful, such as the the Cinnamon and Oregano Old Fashioned, which is lightly smoky with sweet spice. The Lavender Aviation, another classical interpretation with lavender syrup added to the gin based drink. Expecting a vibrant lilac, it is unfortunately not the most visually appealing cocktail. The most unusual drink of the night and one that will be sure to wake your date up is the Thai Chilli Crush. A wildcard of a drink, this cocktail was recommended by our waitress and she asked us what level of heat we wanted from mild to hot. I went for a medium. Garnished and muddled with fresh chilli and Thai basil, this really does have a nice kick, kindly offset by the Tanqueray gin and green apple liqueur. With so much choice in the city, I hadn’t had a full meal at The Botanist before. Just lots of cocktails, wine, some nibbles and a bit of Musical Bingo! I really wasn’t sure what to expect from the restaurant and as such, quite excited to find out. For starters we chose a few plates that can also be ordered at the bar as bar snacks whilst enjoying drinks. 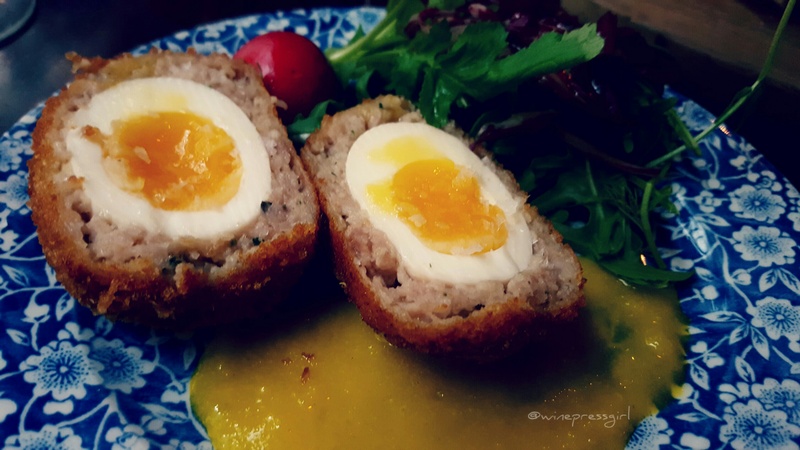 The Homemade Scotch Egg with piccalilli, bright yolk and still gooey. 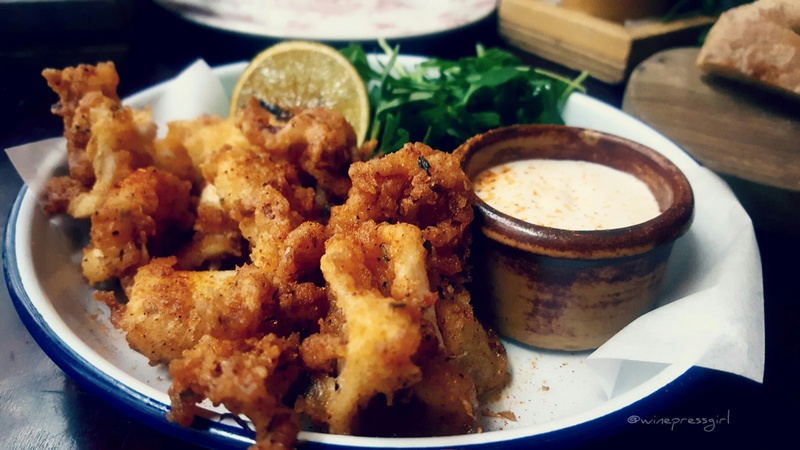 Arguably the best Crispy Calamari in Birmingham (with so many getting it wrong), flavoursome Piri Piri salt, served with a lemon and lime mayo. Gambas Pil Pil cooked in chilli, garlic and olive oil. The prawns were juicy and thick and a decent portion size too. 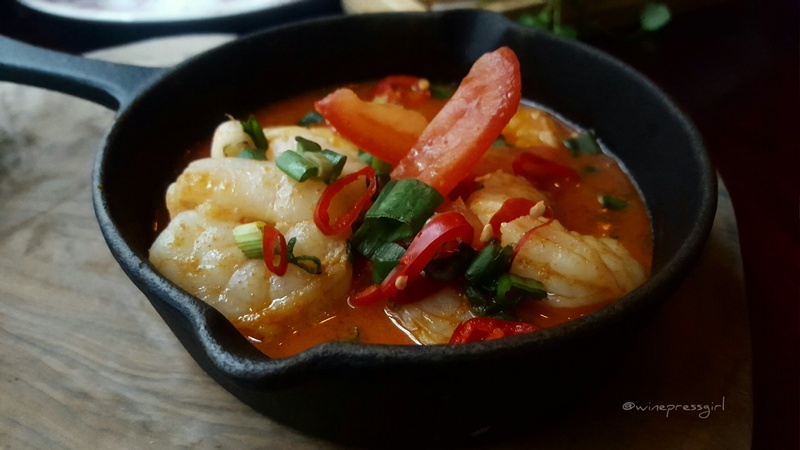 I would have liked the prawn starter to raise the ante on the chilli and garlic, it was too light and not as flavoursome as expected. The Crispy Whitebait is on the nibbles menu and a pleasant surprise. You have to try these little cayenne dusted, deep fried fish. The saffron mayo that comes with the whitebait is also very tasty. 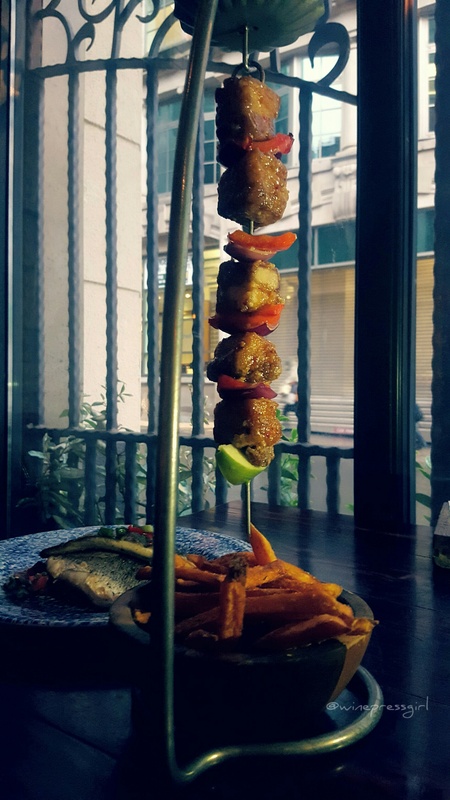 The food menu at The Botanist is largely inspired by home comforts, with a major feature being their famous and trademarked hanging kebabs. They also have dishes like the Jerk Pork Chop with pineapple salsa, Crispy Salt and Pepper Beef Salad, Prawn and Chicken Gumbo with bacon, rice and peas, and the Malaysian Chicken Curry. My friend settled on the Salt and Pepper Pork Belly Hanging Kebab. It’s served with chips which my friend exchanged for their Piri Piri Salted Sweet Potato Fries. The meat is very tasty and I’m surprised my friend wanted to give me a bit to try. Very delicious! I chose the Pan-Fried Seabass Fillets. I hate tomatoes so was weary of getting this dish as it came with tomatoes. The tomatoes came as a dressing with spinach and piri piri. 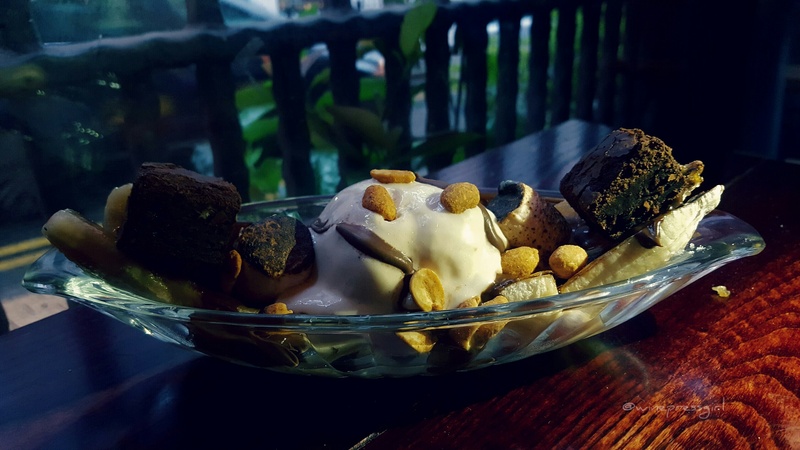 We finish with desserts, they all look good so the waitress recommends the Caramelised Banana Split, oh sweet baby Jesus. I thought I had already found my favourite dessert in Birmingham, this is now a close contender. I now have two favourite desserts in Birmingham and no this does not include wine! If you don’t want a sweet dessert get a cheeseboard or another cocktail! For a chain restaurant I am largely impressed by The Botanist. I could spend a whole afternoon drinking cocktails here as there are so many drinks I want to try. The wine list is superb and they also have an ale bible. The food is affordable and there are lots of different options. It literally is the kind of place that I would recommend to colleagues. We recently went as a team to play musical bingo and we hope to visit again very soon. I was invited to sample and review the new menu by The Botanist, and as such this meal was complimentary. As always, my writing and my honest views.